Join us in calling on the World Bank and the International Monetary Fund (IMF) to cancel Nepal's debt. Over the course of three weeks, two major earthquakes struck Nepal and took over 8,000 lives. Nepal is one of the poorest countries in the world and pays nearly $600,000 a day in debt. Jubilee USA calls on the IMF and the World Bank to immediately cancel Nepal's debt to support recovery and rebuilding efforts. This February, Jubilee USA won a new debt relief trust fund at the IMF designed exactly for this purpose - aiding poor countries in times of crisis. This fund could cancel the $23 million Nepal owes the IMF over the next two years, but only if we act. Meanwhile, Nepal owes the World Bank $1.5 billion in debt. We call on the World Bank to cancel that debt and create its own emergency fund for poor countries in crisis. 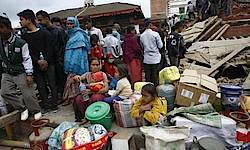 Please sign and share our petition calling for debt relief for Nepal.